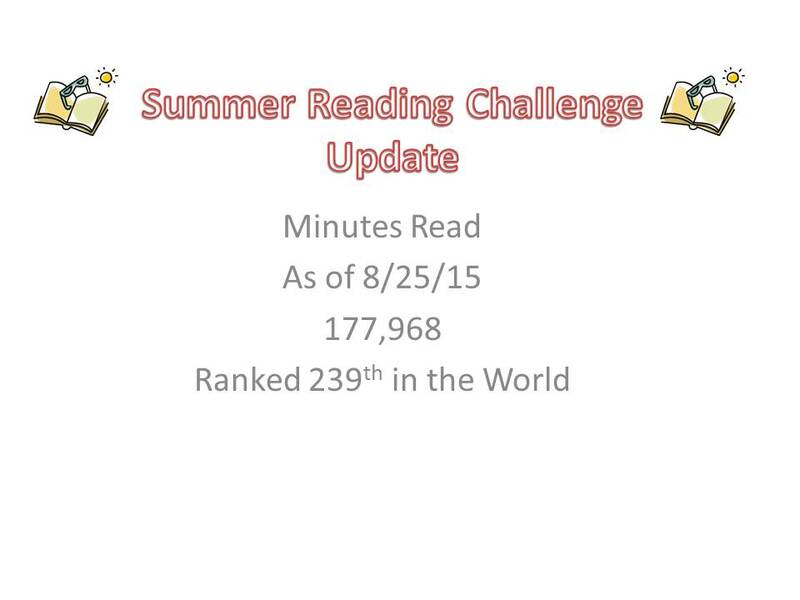 This summer our school has been participating in a fun reading project: the Scholastic Summer Challenge, featuring Read for the World Record. The Summer Challenge unites students from around the globe in an attempt to set a new world record for most minutes read over the summer! The world record attempt began on May 4th and concludes September 4th, 2015. We have made it through the summer, and you are doing a terrific job motivating your child to read! This is a friendly reminder to keep encouraging your child to read every single day. We will be tracking minutes up until 3:00pm on September 4th. Students can track their summer reading minutes at home by signing on to www.scholastic.com/summer. It’s a kid-friendly, safe online community where students can be part of a record-setting global team and log their reading minutes. If your child was not able to log on this summer, they can still log their minutes here at school. Please send any Summer Reading Logs back to school and their new teacher will help them log those minutes. Every minute counts!!! We will be having a celebration after September 4th to honor those who read during the summer! Thanks parents and students for all your effort this summer!